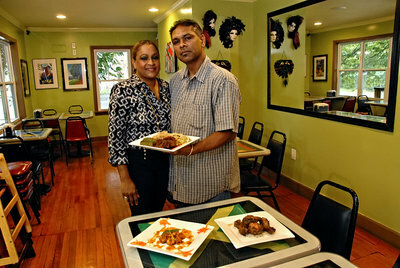 Tassa Caribbean Cuisine has been making delicious food and the freshest roti in the greater Atlanta area since 2006. Tassa Marietta was established in February 2006 by self-taught food creator and passionate entertainer Radhika (Ria) Edoo. It has since garnered the attention of Atlanta’s most respected critics and publications, and has become a to-go spot for some of Hollywood’s most famous faces. Check out our wall for yourself, or visit our media page! Fueled by a noticeable lack of Caribbean fare, Tassa Alpharetta was an obvious decision. Tassa Alpharetta is conveniently located on Old Milton Parkway with ample parking, making it perfect for a quick lunch or a large group. Make sure to sign up for our newsletter on the left hand side of this page; that’s how we’ll let you know about all the fun, like karaoke nights and comedian smackdowns! If you’ve been craving oxtails, curry goat, or a chicken roti; if Bahama Breeze is the most Caribbean food you’ve had and you’re ready to try something authentic, come to any of our locations for curry with a smile. Native islanders and non-islanders alike flock to Tassa for this authentic reflection of Trinidad and Tobago, and the Caribbean region.